Our dedication and loyalty towards our work has made us leading Laboratory Furniture Manufacturers. The large range of quality products supplied by us to our customer show our devotion towards our work. Customers see our quality in clean functional lines. They feel it in the strong-hold of a well-made unit. And they experience it in design assistance, installation and after-sale service provided by us. MK Enterprise has built fully-welded, heavy-gauge, steel base cabinets of rigorous benchmarks. Base cabinets are available in many forms of cupboard units and drawer units. Cabinet Body - Heavy-gauge formed and welded steel cabinet body construction provides strength and durability. Flush corner construction for smooth seamless cabinet face. One-piece case bottom and horizontal front rail. Adjusting bolt access hole with removable plug button. Completely enclosed toe space promotes laboratory cleanliness. Environmentally friendly, electrostatically applied powder-coat finish. Two-piece door construction painted before assembly. Structurally sound deadened for added rigidity and quiet operation. Full access drawer with lock open feature. Interchangeable, interlocking drawer head, sound deadened for quiet operation. One piece drawer body with radiuses bottom for easy cleaning. Ball bearing drawer rollers for smooth and quiet operation. Today's scientific laboratories need customization to meet very specific and high-end requirements. We provide innovative custom product solutions to meet your requirements. 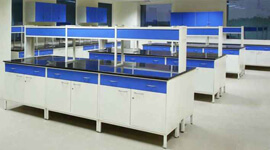 We are known among the leading manufacturers of laboratory furniture.